For those of you who have ever been a part of something truly inspiring, this image is for you. A combination poster, t-shirt design, and flyer, this image has been used for everything. So often in life, it is the simple things that become the most beloved. This basic black & white silkscreen transfer was used for several years while I was college to announce an upcoming art league meeting on flyers, posters, trees... pretty much anything with a large surface. 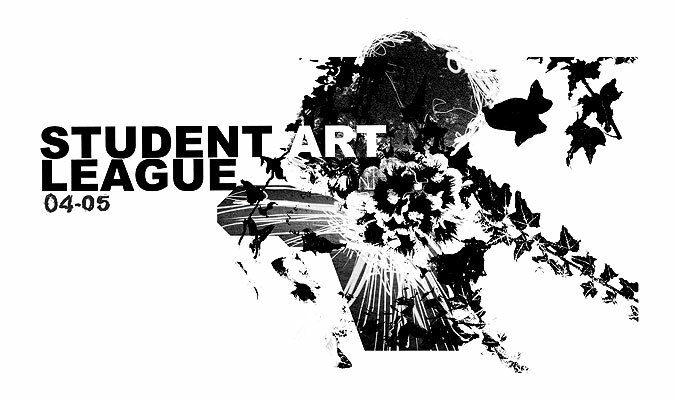 For it's last and final use, all art majors were invited to come to a meeting to screen one final t-shirt in the honor of Art League. Aaahh... Good times. Over the past few years I have totally forgotten about this image until today â€“ when I came across it while doing some spring cleaning. The image still warms my heart, and I thought I would share. 35mm B&W film, Photoshop, Helvetica, and a lot of black ink.